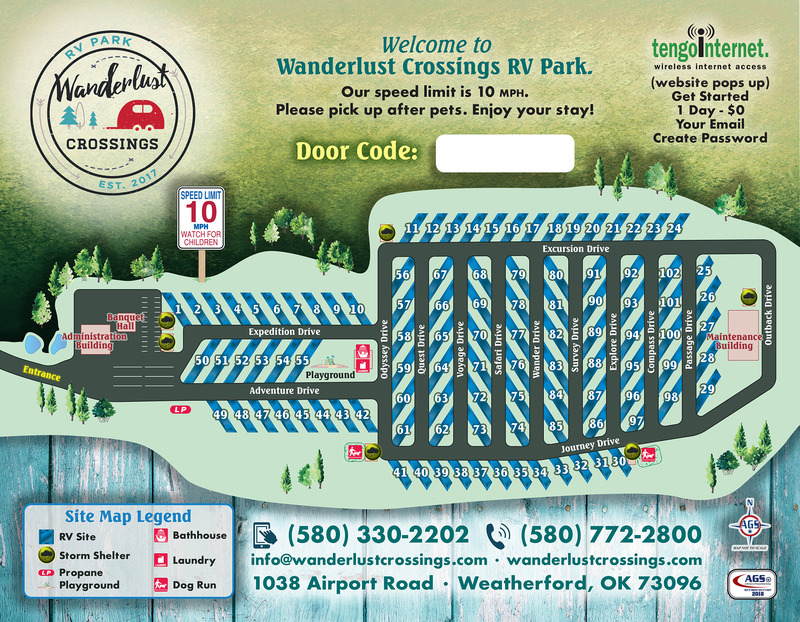 Ask fellow campers about "Wanderlust Crossings RV Park" and nearby attractions. Beautiful newer park very easy to navigate a big rig around towing car. Every lot is concrete and level. Wonderful place to stop. Stayed an extra day to tour town. We camped at Wanderlust Crossings RV Park in a Motorhome. New park, well designed, only negative was wifi. You had to setup an account and only get one day free. We camped at Wanderlust Crossings RV Park in a Travel Trailer. Pizza will deliver here, as we saw others doing that. Fabulous. 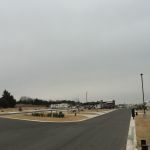 Really nice new RV Park with very friendly staff and a cute store. 1/2 m off the freeway, level cement pull thru pads, picnic table, fire pit, super clean bathrooms/showers. Open, so pretty views, excellent DISH and Verizon Reception. Very quiet. Will definitely stay here again. We camped at Wanderlust Crossings RV Park in a Motorhome. Beautiful sunrise! Super clean and warm showers. Everything is spotless. Brand new beautiful facility, everything top notch Nice owners excellent service Came and picked up my propane tank and delivered them back to my site! Dog wash onsite but unfortunately wasn't working when I was there We camped at Wanderlust Crossings RV Park in a Travel Trailer. This place rocks!!!! They maintain the campground immaculate. They have thought of everything. A dedicated dog wash. Kids area. The water hook up insulated so it doesn't freeze. The sites are spacious. Could accommodate our 43' motorhome and tow with no problem. Easy on and off interstate. Front office very professional and friendly. The entrance is so pretty with a cascading koi pool. Well lit at night, secure and quiet. We camped at Wanderlust Crossings RV Park in a Motorhome. Very nice, brand new park. Large sites with many pull through. Two fenced in dog parks. With large field behind them to really run the dogs. We met here for a RV rally with 50 other DRV fifth wheels. Nice stay We camped at Wanderlust Crossings RV Park in a Fifth Wheel. We absolutely loved this park! The sites were long and wide, cement pads, ours was very level. The grounds were kept very clean and they had pretty little fountains on every other corner. Used the laundry facilities which were also clean and only $1.50 for wash and $1.50 for 48 minutes of drying. Two nice dog parks. All the staff we talked to were very friendly. We would definitely stay again. We stayed 3 nights. We camped at Wanderlust Crossings RV Park in a Motorhome. We stayed here for just an over night but from the minute we pulled in we wished we could have stayed longer. Everything is first class. The check in process was very smooth. The park is laid out in a manner that it is easy in/easy out. The owner developer put some real thought in how the park is designed. We were close to the freeway but didn't hear any noise. The park is one of the finest parks we have ever stayed at! We camped at Wanderlust Crossings RV Park in a Fifth Wheel. I was pleasantly surprised today when we pulled into our overnight stop in Weatherford, Oklahoma. Thought it would be just OK at best, considering it's in the middle of nowhere. On the contrary: it is amazing. Level concrete pads, everything clean as can be. The place even has a dog wash station! No shade (the trees are newly planted) but still a great stop over. We camped at Wanderlust Crossings RV Park in a Motorhome. Rate includes a Good Sam discount for our overnight stay. The site was long, concrete, pull-thru, level, with FHU and 50 amp electric. We had good Verizon voice and data reception and good DishTV satellite reception. The park is new and seems to be well managed. The sites have concrete pads and the grass areas are nicely mowed and trimmed. All the sites look level, but at some sites the grass area where the picnic table is located is sloped. The park is easily accessed from the Interstate, but has no highway noise. We would stay here again. We camped at Wanderlust Crossings RV Park in a Motorhome. Looks like a brand new park. Well laid out and beautiful. Friendly staff. Our site was very nice (#55). Concrete pads, well laid out utilities. Will definitely stay here again. We camped at Wanderlust Crossings RV Park in a Motorhome. So nice to have a well thought out park. 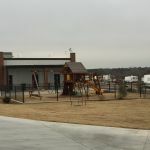 Green grass, landscaped with trees and waterfalls, paved, picnic tables, storm shelters if needed, fenced dog parks, with poop bags, playground, loved the dog wash idea. Family owned and friendly staff. 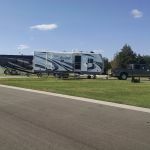 We camped at Wanderlust Crossings RV Park in a Motorhome. Thomas Stafford Air and Space Museum is interesting and well done. This is an easy park to get in and out of with a 45' motorhome with a tow. Did not have to disconnect. Most sites are pull through and in full sun. A few back in sites have shade. Well kept and relatively new. Convenient to restaurants. If you are in the area, this is the place to stay. We camped at Wanderlust Crossings RV Park in a Motorhome. Nothing but greatness to say about this park. Was one of the best ones we have stayed in. 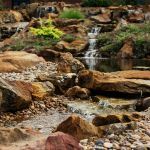 Really nice landscaping and waterfalls throughout the park. Large lots w/ability to stay hitched when pulling in, wide roads are great. The staff was super friendly and the store/office is awesome, has grilling accessories and creative extras. Pool table, TV area. We normally do not use the bathhouses at parks, but this one was nice because it gives you a private dry area outside the shower as well as great water pressure. We will absolutely tell everyone we know about this park and be back ourselves!!! Great Stay. We camped at Wanderlust Crossings RV Park in a Motorhome. Lucille's Roadhouse Restaurant is just about 1/2 mile from the RV Park just North of 40 - great service, food and a fun map of Route 66 stops. Have fun! This is a beautiful immaculate park. Lots of manicured grass between the sites. They have a cascaded water feature at the entrance and at the end of most streets. Lots of room on concrete pull thru pad so no need to disconnect the tow. Staff is very welcoming and friendly. This park would definitely be my first choice if I am in the area again. We camped at Wanderlust Crossings RV Park in a Motorhome. There is a great space museum in Weatherford which is worth visiting if you have the time. We were tired after a long (and very windy) drive so did not explore the area - did note that Weatherford does have a Walmart for those last minute groceries. Route 66 Museum and The Air and Space Museum were both interesting. Weatherford, OK, not exactly a destination town, but toured the Stafford Space Museum--interesting. Great dinner available about 5 miles west at the White Dog Hill Restaurant--unique old building. Park is very convenient to I-40 but far enough away to not hear traffic. This new park is done right and should have a great future as word spreads about it. Take time to go to the Stafford Air and Space Museum...amazing. The Heartland Museum was entertaining and captured a look at the past. If you see all the wind farms and wondered just how big they are, stop by the Wind Power Park. 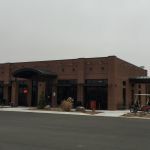 Within a stone's throw of the RV park is Deep Creek Burgers and Pizza. Pizza was excellent. Restaurant is light on signage and sits behind a car dealership...but worth the stop...look for it. The staff here was great. very welcoming to weary travelers. Landscaping is new and young.... but will be very nice when a bit older. Really enjoyed this peaceful place. BTW we called Chief's RV given by park owner and he's closed for the winter. BUT he called us from Florida and gave us suggestions for what we might look for and possible correction to our problem!! Now that's service!!! This was an overnight stop for us. We would stay longer on next trips to explore the area. There is a wind energy center in town but we did not have time to visit. It sounds interesting. The Thomas Stafford Space Museum is a must see! 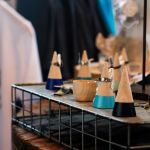 Other things to see and do: Roman Nose State Park (Watonga), Route 66 Museum (Elk City), Roger Miller Museum (Sayre), Red Rocks State Park (Hinton). 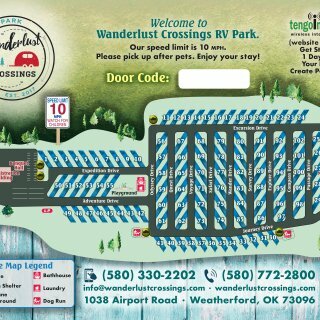 Are you affiliated with Wanderlust Crossings RV Park ?